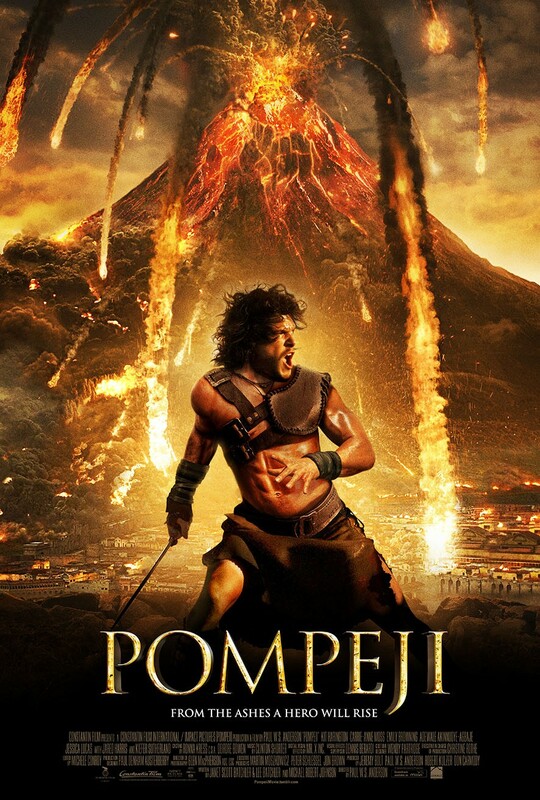 Set in the year 79 AD, Pompeii is a story of the final days of the city that would be destroyed by the eruption of Mount Vesuvius. The story is centered on the lives of a wealthy merchant woman, Cassia, and on a gladiator, Milo. Their lives are intertwined with a corrupt Roman Senator, Corvus, who has managed to have profoundly negative impacts on both Cassia and Milo. On the night of the screening of Pompeii the omens of what was to come were plentiful. The most profound of them came as I was waiting for a friend to meet me before dinner. The place where we agreed to meet, The Q Shack, apparently had an issue with a meat smoker that resulted in the fire department being called and the whole complex being filled with the sound of ear piercing fire alarms. Little did I know at the time, but the damage to my ears would soon be partnered with damage to my eyes and insults to my intelligence. There are three main problems with this movie that just ruined it for me; terrible characters, an unbelievable story, and insulting special effects. If two out of three of these issues were even passable, this movie would have been a pleasure to watch as a popcorn movie. It could have been something along the lines of 2004’s The Day After Tomorrow, which had an interesting story and very good visual effects that offset some character issues. The characters of Milo and Cassia are passable at best, Kit Harrington and Emily Browning did what they could with the dialogue they were given, but mostly fell flat. Kiefer Sutherland as the villainous Corvus was just plain bad. I know you are not supposed to love a villain, more often you are supposed to love to hate them. In the case of Corvus, his dialogue was so bad and his character so stereotypical I wanted to hit fast-forward anytime Sutherland was onscreen. Several other characters that were granted significant screen time seemed to have no real purpose at all. Joe Pingue as Graecus contributed the same thing as Currie Graham’s Bellator as the boss/owner of the slave gladiators. Why waste valuable time on those duplicated characters when you could use that time to better develop the other core characters? The story, where to begin? The main story of the movie takes place over what feels to be less than a week. During that week we are asked to believe that it is possible that a dirty, bloody, violent slave gladiator and an aristocrat’s daughter, who are only ever in the same place at the same time about 3 times, fall so madly in love with each other they are willing to die for one-another. “Maybe he just made a great first impression”, you say. If snapping the neck of a horse with your bare hands is a great first impression in the eyes of aristocratic Roman women, then you may be right. The final fatal flaw of this movie is in the special effects and final action sequences. If you have seen 2012 and you remember John Cusack making a stretch limo bend the laws of physics to the point where Einstein would roll over in his grave, then you have an idea of what happens in Pompeii. Apparently the horses that were raised and trained in ancient Naples are a breed that is immune to the sense of self-preservation that most all other mammals seem to be equipped with. It is also interesting that every time Milo and Cassia decide to have a tender moment Vesuvius is super polite and halts its explosive violence just long enough for them to get it in. I do have to give the makers of Pompeii credit for a couple of things that they did manage to make look good or get right. The scenes of the actual eruption looked every bit as scary as you would imagine it to be. Also, the fight scenes in the arena with the various gladiators had some good moments. Finally, Adewale Akinnuoye-Agbaje deserves credit for his portrayal of gladiator badass Atticus; he was someone that I had no problem rooting for. So, if you enjoy disaster movies that are a disaster themselves, then this one is a runaway winner for you. If you are like the rest of us who would rather not set fire to our hard earned money, skip this one.